LWF President Bishop Dr Munib A. Younan, assisted by General Secretary Rev. Martin Junge, presents Pope Benedict XVI with a gift from Bethlehem depicting the Last Supper. Second from left is Vatican employee Francesco Cavaliere. We are called to work to eradicate poverty, to be prophetic against injustice, to be bridge builders between South and North and East and West, to strengthen our sisters and brothers who suffer or find discrimination because of their faith, and to be responsible for the integrity of creation. The Joint Declaration on the Doctrine of Justification is a document created by and agreed to by the Pontifical Council for Promoting Christian Unity and the Lutheran World Federation in 1999, as a result of extensive ecumenical dialogue, ostensibly resolving the conflict over the nature of justification which was at the root of the Protestant Reformation. The Churches acknowledged that the excommunications relating to the doctrine of justification set forth by the Council of Trent do not apply to the teachings of the Lutheran churches set forth in the text; likewise, the churches acknowledged that the condemnations set forth in the Lutheran Confessions do not apply to the Catholic teachings on justification set forth in the document. Confessional Lutherans, such as the International Lutheran Council and the Confessional Evangelical Lutheran Conference, reject the Declaration. On July 18, 2006, members of the World Methodist Council, meeting in Seoul, South Korea, voted unanimously to adopt this document as well. Here is personal, anecdotal evidence of the grass roots ecumenism of which Hanson speaks. I hail from Upsala, Minnesota, originally a Swedish community that actually had a Ku Klux Klan chapter in the anti-German days of WWI, but the purpose of the chapter was not to repress blacks (there were none) but to keep Catholics out of Upsala. The local Swedes covenanted with each other that they would not sell real estate to Catholic purchasers. Didn’t work. Skip ahead to 1954, and the Roman Catholic church building from nearby St. Francis in largely German-Catholic Stearns County was moved slowly on rollers five miles north to a prominent place on main street in Upsala. A very real and symbolic movement of the German Catholics from the south that corresponded with an influx of Polish Catholics from the east (Bowlus, Sobieski, Little Falls). Grandma Hilma was sure the end times were near. But, by the 70’s, the Lutheran pastor, the Roman Catholic priest, and the pastor from the Covenant church joined together in a singing group that appeared at nursing homes and elsewhere and also jointly organized a senior center in Upsala. Local clergy continue to work together in an active ministerial association (the only non-participant is the pastor from the small Missouri Synod (LCMS) congregation in town). 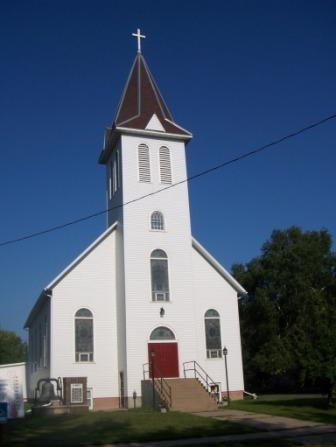 Most recently, in just the last few months, the Roman Catholics replaced that wooden building that had been relocated to Upsala fifty-six years ago, but the new building would be on the same site as the old one. Where to gather for mass during construction? My old congregation, perhaps including the descendants of those who once covenanted to keep the Catholics out of town, offered the use of their facilities and insisted that no rent or remuneration would be accepted. Construction was completed early in December, and the Catholics at St Mary’s are proudly worshiping in their own building once again. And, the Lutherans from Gethsemane will soon be their guests for a day when the regular Gethsemane Sunday worship service will move to the new Sanctuary of St. Mary’s, to be followed by a brunch hosted by their Catholic friends. Just as the Catholics celebrated their Eucharist in the Lutheran church building, the Lutherans will now celebrate their Eucharist in the Catholic church building. I suspect the folks at both St Mary’s and Gethsemane would be just fine taking the final step and actually celebrating the Eucharist together but for official Roman Catholic policy, but the symbolism of the current events is a striking example of grass roots ecumenism. The Lutheran World Federation (LWF) President Bishop Dr Munib A. Younan has invited Pope Benedict XVI to work together with the Lutheran communion in realizing an ecumenically accountable commemoration of the 500th anniversary of the beginning of the Protestant Reformation. Secondly, Bishop Younan expressed similar sentiments to those of Bishop Hanson about the continuing inability of Catholics and Lutherans to celebrate the Eucharist together. I studied with the School of Theology at St John’s Abbey and University in the early ‘90’s. Once a week, the resident students hosted a meal for the non-residents followed by a mass. But, a couple of seminarians protested that this was contrary to Catholic doctrine because many of the non-residents were non-Catholics , and the joint mass was discontinued–to the common pain of most of us, Catholic and Protestant alike. In defense of this exclusive policy, one seminarian suggested that when the rest of us accepted the Catholic understanding of the Eucharist, then we would be welcomed. By that standard, I shouldn’t be celebrating communion with most Lutherans, since I’m sure we don’t all share the same understanding; nor is the understanding of the communing children in our congregation likely to be anywhere close to the understanding of the adults. At the joint meeting, the Pontiff expressed continuing support for ecumenical dialogue without addressing Catholic exclusivity around the communion rail. Cross posted at Spirit of a Liberal blog. Thanks, Olbie for this inspiring post. It should be obvious that we all need to work together: the question is how? These grass-roots, local initiatives are a good place to start – but the where to? The progressive, social justice bias of the LWF should make a good fit with much of the real heart of Catholicism, but will come up short against its antediluvianism on sexuality – and the supremacy of Rome. I fear that it is this question of papal dominance which will be the major sticking point with any denomination that tries for closer ties. Sadly, many Catholics would agree that the centrality of the pope is overblown, but I don’t see any sign of the Vatican bureaucrats relinquishing their power and comforts just yet. I am a former Catholic, now ELCA, and this warms my heart. My family pitched a fit when I converted – but I always suspected we had more in common than differences. This article confirms that! In any meetings between Catholics and Lutherans, I hope someone points out the powerful corollary between Martin Luther’s concept of “The priesthood of the people,” and Vatican II’s declaration of “The people of God.” Nothing–except for Catholic bishops, especially the Bishop of Rome–could demonstrate the reality of closeness more. Choose bishops locally and have the lay people and clergy manage their own dioceses. That, of course, eliminates the need for the dictatorship of the foreign Vatican. The ELCA and the Missouri Synod have both lost between 1/4th and 20% of their memberships since the mid-80s. The Catholics have so many ex-members that “Ex-Catholics” would be the 2nd largest denomination in the US if they were to organize. Religion itself is the problem. You’re still arguing about who’s got the message from someone invisible. Get a life.